There was no post-office at Chicago when Cook County was organized, March 8, 1831. On the 3lst of the same month the United States government established a post-office at Chicago and jonathan N. Bailey was appointed post master. The office of the postmaster was situated in a log building about where South Water street intersects Lake street near the east end of the bridge. John S. C. Hogan kept a store there. He was a son-in-law of the postmaster. Before the post-office was established the mail was brought to Chicago by a half-breed Indian once in two weeks from Niles, Michigan, at town on the route from the east to Chicago, says Governor Bross in his history. The trip was made by the carrier on foot and usually took a week. There were then in Chicago, says Bross, only about a dozen families which, with the officers and soldiers of the garrison at the fort, constituted the entire population of the place. The Indians who resorted to this point for trading are not, however, included in this enumeration. “The mail-carrier,” says Mrs. Neville, “was necessarily a man of tough fibre and strong nerve, for, burdened as he was with his pack, mail pouch and loaded musket, he was forced to keep on his feet day and night wading through snow so deep at times as to require snow shoes. When overcome with sleep be wrapped himself in his blanket and lay down in a snow-bank, taking such rest as he could with the wolves howling around him.” In E. O. Gale’s book of reminiscences he relates that Alexis Clermont, a famous mail-carrier of that time, on one occasion took breakfast with his father’s family the morning after his arrival at Chicago with mail, and it was noticed that he seemed anxious to start off on his return trip. The elder Gale asked him why he was in such a hurry and he replied that he slept better out of doors than in a cabin. In 1837, by stage daily: and after that time at in creasingly short intervals. Bailey served as postmaster until November 2, 1832, when he was succeeded by his son-in-law, John S. C. Hogan, who moved the post-office to the south west corner of Franklin and South Water streets. The Illinois and Michigan Canal Commissioners hired James Thompson, a surveyor from Kaskaskia in downstate Randolph County, to create Chicago’s first plat in 1830. 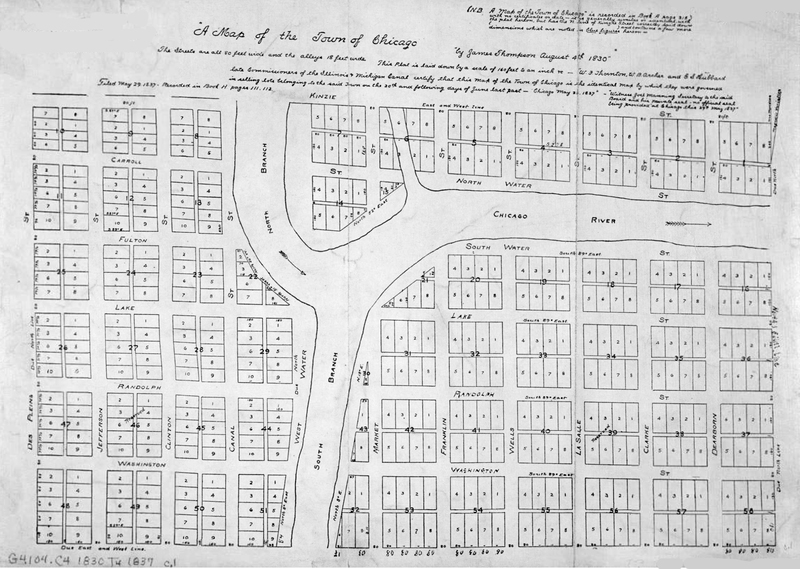 He laid out the town with straight streets uniformly 66 feet wide (the length of a surveyor’s chain) with alleys 16 feet wide bisecting each block.